Is it the interest rate or the price that is driving your personal decision on buying a home? Have you heard anyone say they are waiting to buy a home for prices to go down? I hear this almost everyday. Buyers tend to get hyper focused on the actual price of the home they are buying. We’ve been taught from a young age about getting the best price on anything we want to buy. Is price the most important factor in your decision? Are you paying cash? Perhaps then price is more important than the interest rate on your loan. If the interest rate is good, there are programs available to assist. For example, you can use cash to close in 17 days to get the deal. Then, while in escrow AND under contract, you must qualify for a delayed financing loan. After you close on the original sale, you complete the delayed financing loan and take out a mortgage on your original purchase with almost all your funds returned in cash to you. (Ask me how?). However, when you look at what you are able to qualify for on a loan when the rate increases you actually lose your qualifying buying power at the new rate. According to a realtor.com survey, “Forty-four percent of home buyers say rate increases likely will force them to settle for a smaller, less expensive home that requires a longer commute to their jobs.” The FED has stated they predict issuing two more modest increases in rate this year so the longer you wait the higher the rate can potentially be on your new purchase. Last week the 30-year fixed-rate mortgage averaged 4.46 percent (according to Freddie Mac). This is the highest rate in 4 years however historically low. Are you planning to remain in your current market area long term? 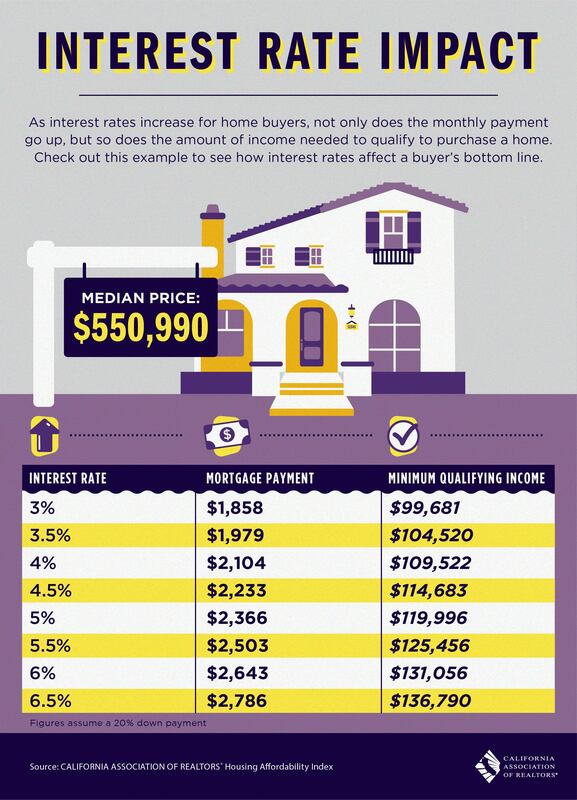 Then buying with a lower interest rate is more important than the purchase price. The average buyer says in their home only 3-5 years. The math doesn’t lie, check out the examples below for CAR (California Association of Realtors). Need help finding a good lender here or anywhere in the USA, call me (619) 388-9649 I have referral partners all over the USA. Need a Realtor here, in any of the 50 states or overseas, call me, I’ll refer you to someone qualified. Not only am I licensed agent in California, I've got 5 years on the lending side and a post college Paralegal Degree. I don’t take no for an answer.